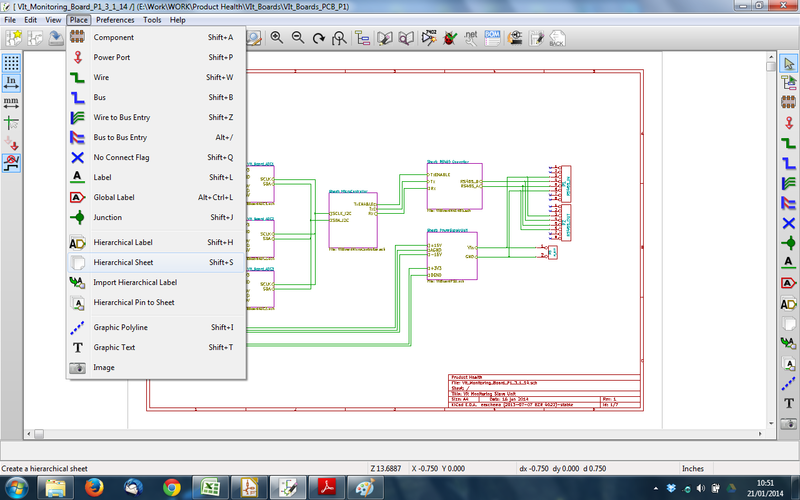 For PCB design I use the open-source schematic and PCB design software KiCAD. Its a great program and has gotten a lot better recently. It is unlimited in size, components and number of layers and has lots of the features of very expensive professional PCB layout software. There are times when having just one schematic sheet is not enough space. 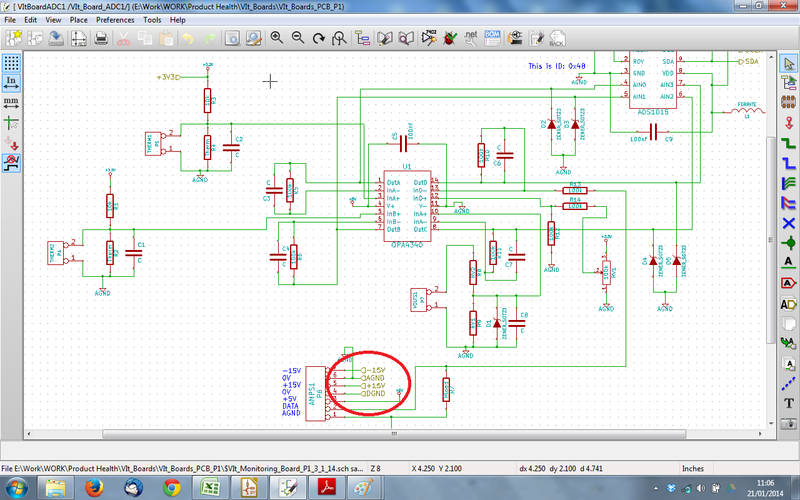 Also it is useful to break apart the schematic to keep a nice structure and order to the design. 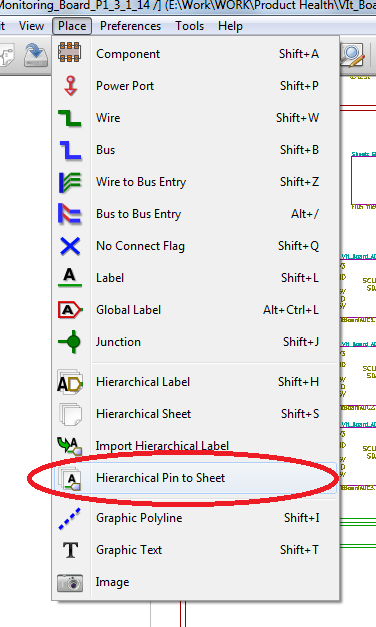 This is a post on having multiple sheets within the schematic using KiCAD, which is called “hierarchical sheets”. These are my notes on doing this and any problems encountered. Which was exactly what I needed and guides you through the process of creating a multiple page schematic with hierarchy. 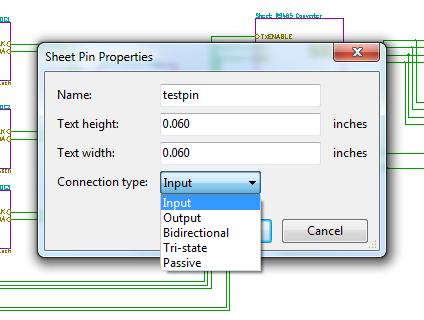 On your sheet you can place a Hierarchical Sheet from the Place menu – this will bring up a pop-up with the schematic name. I used more human readable file-names. 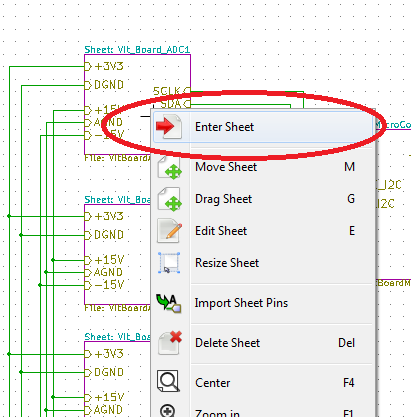 When I needed to repeat parts of the schematic, I created a sheet and the copied and pasted it within the PCB design folder. You can then create more Hierarchical sheet boxes and point them to the copies of the sheet. This will give you a number of copies of the same schematic, but you will need to clear and then re-run the annotation, as they will have the same part IDs, which will confuse things. 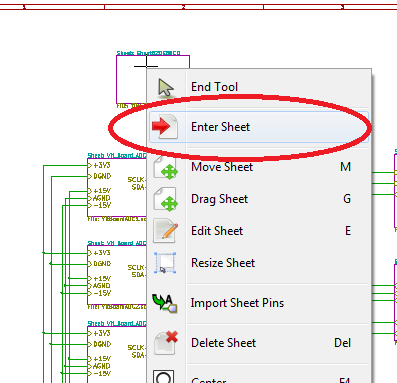 Right-click on the Hierarchical Sheet box and then ‘Enter Sheet’ to produce your schematic. To link input data into your sheet, you can either use ‘Global’ variable names or you can attach Hierarchical Pins to the sheet. You need to attach one to the Hierarchical Sheet box. This will bring up a pop-up box and you can choose the name and direction. 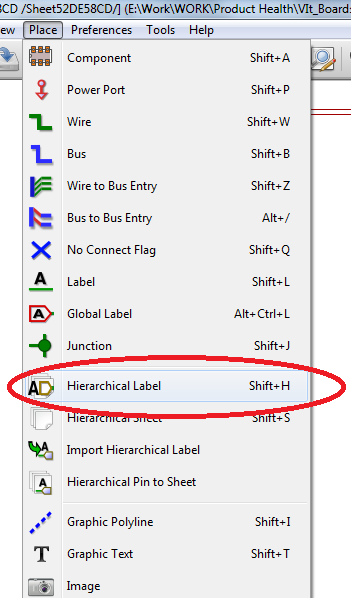 To connect to the pin you need to have a ‘Hierarchical Label’ within the Hierarchical sheet. This connects to the pin on the main overview sheet. You must call it by the same name, or else it will not be connected. Here is an ‘overview’ page which has six heirachical sheets. To see the schematics just right-click and ‘Enter sheet’. 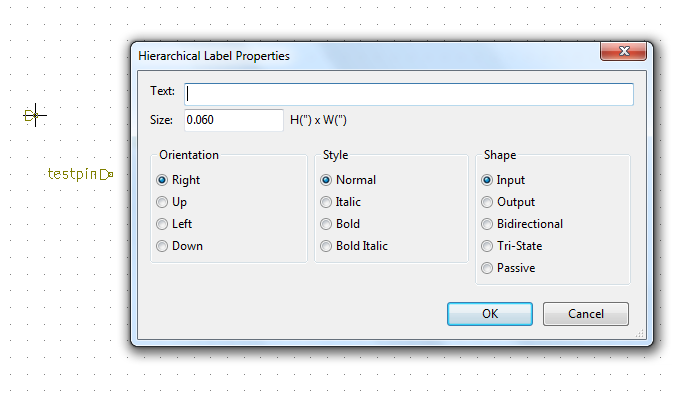 This shows the schematic within the Hierarchical Sheet box. The red circle shows four of the ‘Hierarchical Labels’ which connect through to ‘Hierarchical Pins’ on the main sheet. This is a great way to organise my larger schematics and works very well. Please follow the tutorial linked at the beginning of this post, as that was most helpful to me. You do have to be careful with names of labels, but as long as you are logical then this is not so difficult. When you create the Netlist and the board, then double check that everything you think is connected IS actually connected. I created multiple schematic sheets and in the end I tried to annotate all the components but the numbers are overlapping i.e., I am getting multiple reference after annotating!.. Can I know the solution please? 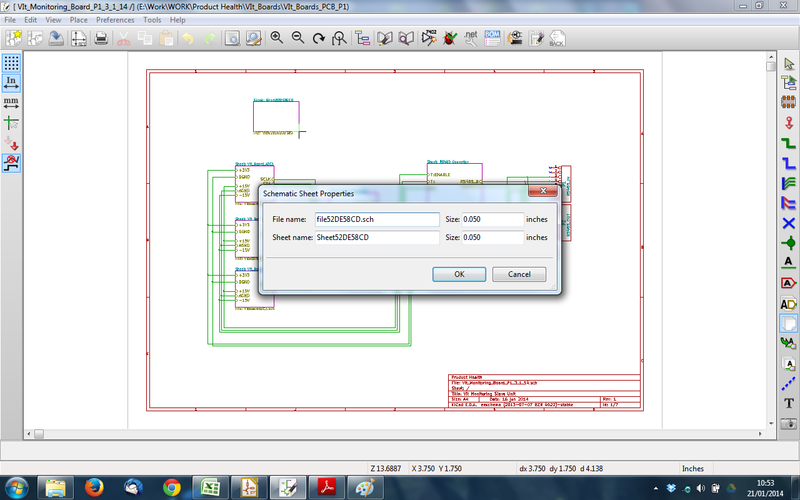 Try selecting “Reset Existing Annotation” on the “Annotate Schematic” dialog. Also do the annotation from the root schematic. 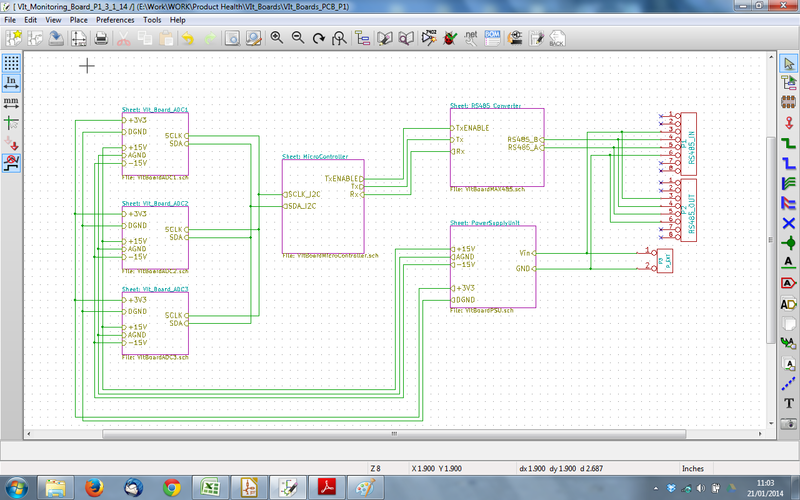 Now that I have created the schematics, is there any way to generate the netlist in this organized way? I mean, any manner of avoiding the huge amount of components overlapped in the PCB new and doing a modular routing.